Remember my post on Crio Bru brewed cocoa, when I mentioned that the Gent and I would be visiting a cocoa plantation on our visit to Trinidad & Tobago? Well, we actually did, and it was delightful! I expected to see cocoa plants, of course, but I was surprised by the many other types of plants growing on the plantation, all of which contribute to a synergistic rainforest ecosystem on the Tobago Cocoa Estate in Roxborough, Tobago. Harry shows us the “cloned” cocoa plants ready for planting. 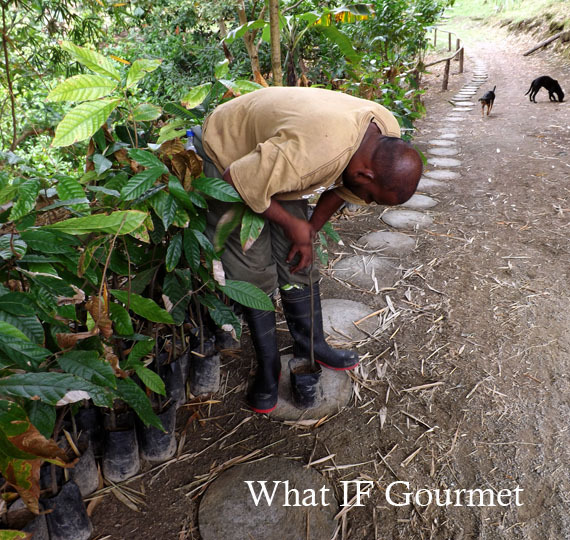 We saw banana plants, buffalo trees, and “immortal” trees, all of which are strategically planted to give their shade to the fragile cocoa plants at various stages of their development. The estate also grows small amounts of coffee, guava, avocado, mango, ginger, sugar cane, breadfruit, and “mother-in-law” (gru gru) — a sour, prickly fruit that grows on tall trees that look like palms. 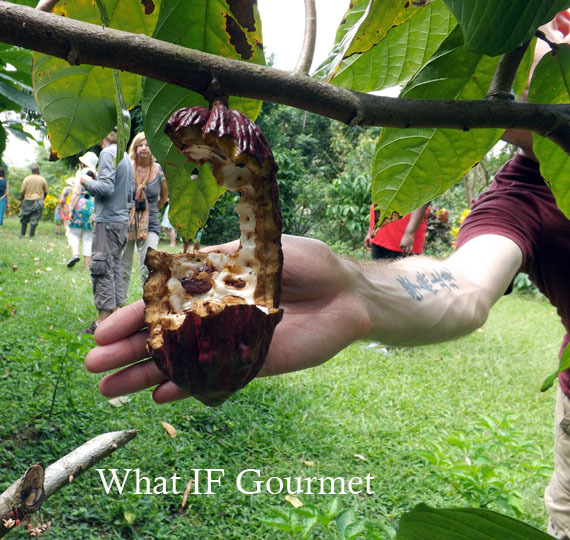 Our party of Brits, Australians, Germans, and Americans, plus native Trini Danielle, of course, followed tour guide Harry, who (machete in hand) led us through one portion of the expansive estate and explained the intricacies of growing fat, healthy cocoa pods. Cocoa pod damaged by critters. The estate keeps a few hawks in its aviary, to hunt the rodents that like to feed on maturing cocoa pods. Harry cut open a ripe cocoa pod and handed it around our group to taste. We each pulled out a cocoa bean surrounded by soft, sticky, white flesh. We sucked and gnawed on the fragrant pulp, scraping it off of the seed with our teeth. It tasted nothing like chocolate, but was intensely fruity, sweet, and delicately perfumed. I had never tasted anything quite like it, but it stirred memories deep in my consciousness, recalling the notes of ripe berry that good chocolate sometimes has. The ripe cocoa pods are cracked open with a wooden mallet, because a blade could damage the seeds, leading to fungus growth. The seeds are then heated in a fermenter until the pulp melts off them. The seeds are then moved into a more refined fermenter. Finally, the seeds (beans) are spread out in a large wooden bed under the hot, tropical sun, and are stirred every fifteen minutes, five hours a day, until they are completely dry. They are then ready for processing. 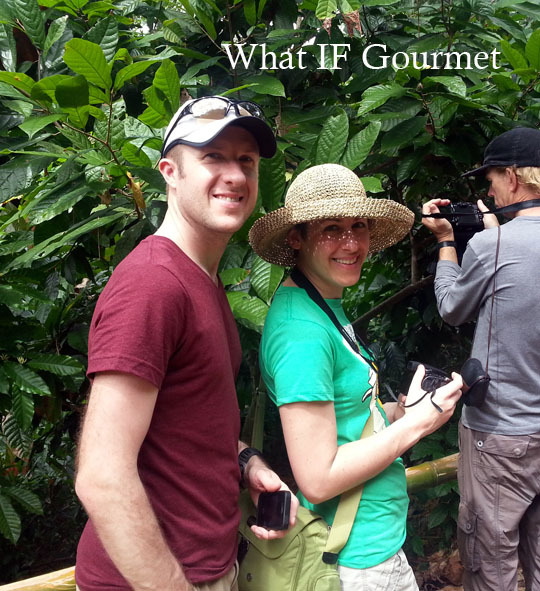 The Gent and I on a tour of Tobago Cocoa Estate (photo by our friend Danielle). The chocolate from the estate is not processed in Trinidad and Tobago. Instead, the harvested and dried cocoa beans are shipped to France, where they are turned into fine chocolate by Francois Pralus Maitre Chocolatier. 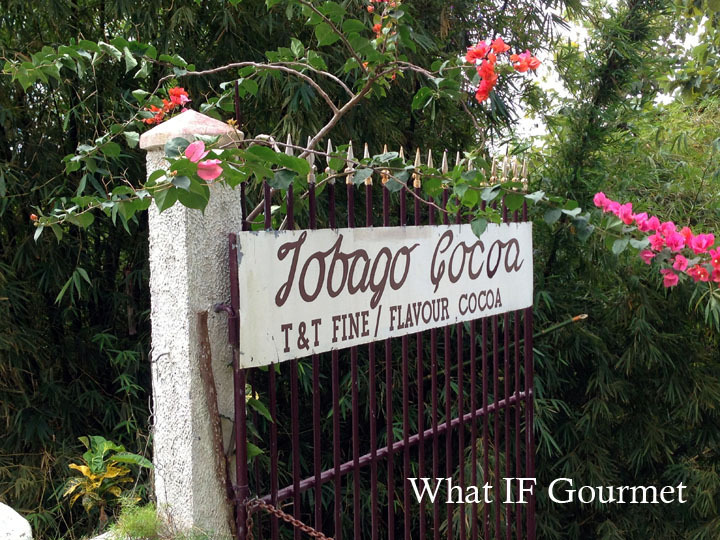 We were disappointed to discover that the chocolate is not sold at the Tobago Cocoa Estate, but Harry assured us we could find it back in Port-of-Spain, which we did with some difficulty. We visited several shops in two shopping malls before finally finding bars of 70% cocoa at Fine Wine & Spirits in West Mall for a whopping $20 a bar (that’s U.S. dollars, not TT). 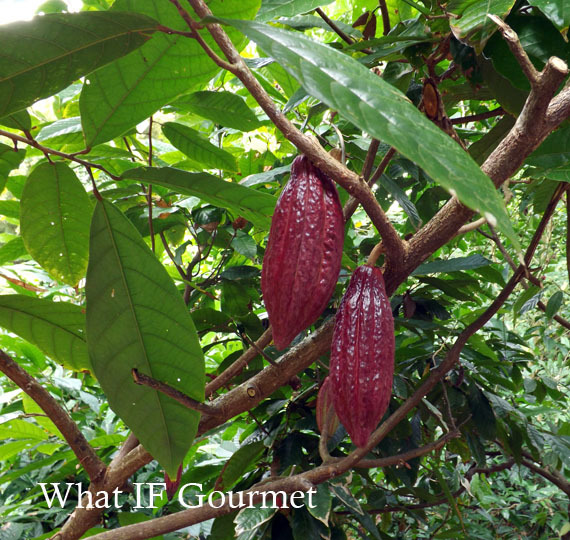 We later learned that Trinbagonian chocolate ranks among the most expensive in the world, and is often combined with “lesser” beans in order to improve their flavor in a broad range of chocolate products. 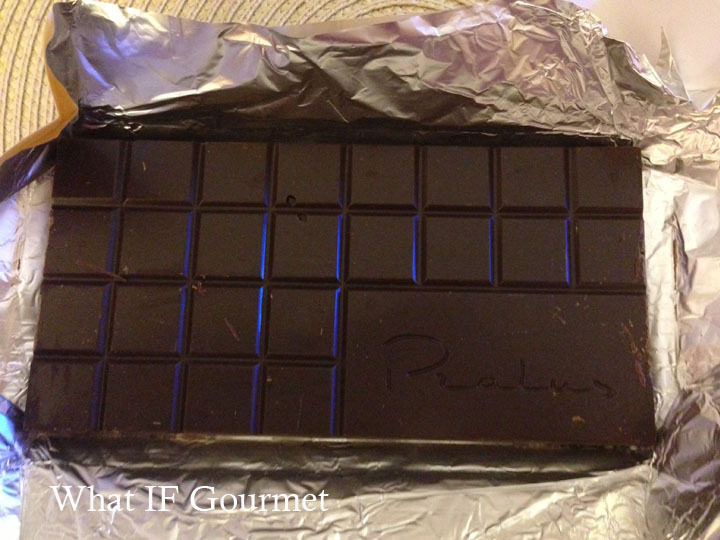 In spite of being a “hard,” dark chocolate with a pronounced snap, the Pralus bar melted on my tongue with a surprisingly smooth creaminess. It may have been my imagination, but I thought I detected hints of that same fruity fragrance from the cocoa pod pulp we sampled in Tobago. The chocolate’s flavor unfolded much the way a complex glass of wine does, layer upon layer. After savoring a few dense bites, I no longer regretted the steep price tag! I have found that dark chocolate works with my anti-inflammatory diet as long as I make sure to consume dark chocolate with a 70% or higher cocoa content, which keeps the sugar content in my safety zone. 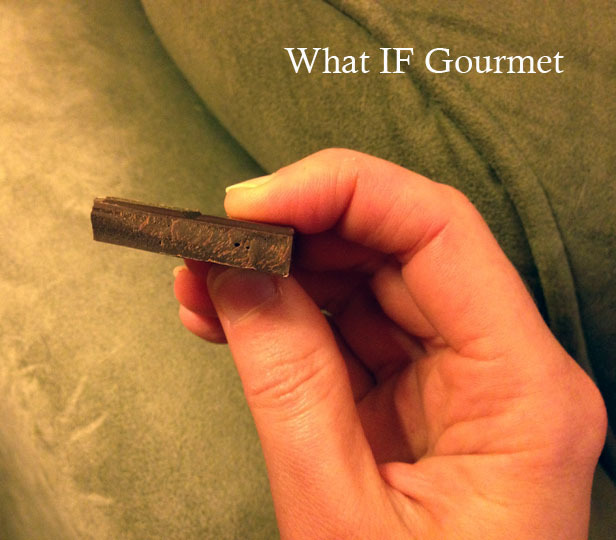 Personally, I’ve found I can eat about one and a half ounces of dark chocolate with 70% cocoa content in a day without concern. I only wish it could always be chocolate of Trinbagonian quality! 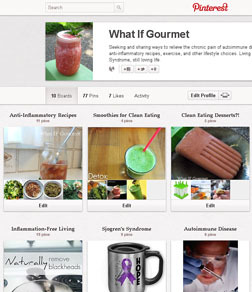 This entry was posted in Anti-Inflammatory Ingredients, Dairy-free, dark chocolate (70% cocoa or more), Desserts, Gluten-free, International, Nut-free, Snacks, Travel, Trinidad & Tobago, Vegan, Vegetarian. Bookmark the permalink.